The bull market is now nine years old, overcoming a plethora of challenges including debt crisis, government shutdown, the Middle East conflict, geopolitical tension, Greece turmoil, China’s soft landing issues, Japan’s recession, a global slowdown, Brexit, the oil price carnage, and Trump’s protectionist stance. In fact, the S&P 500 index has risen nearly 302% from the bear-market bottom of 676.53 on Mar 9, 2009. This is the second largest bull-run in history after the 1990s rally that ended with the tech bubble burst in 2000. The rally came with five corrections (a decline of 10% or more); the last one witnessed in the beginning of February 2018. Cheap money flows and lower interest rates have been the biggest driver over the nine-year period. Since Trump won the U.S. election in November 2016, the stock market has boomed like anything with the S&P 500 reaching a series of milestones – 2,200 in late November 2016, 2,300 in January 2017, 2,400 in May, 2,500 in September, 2,600 in November, 2,700 in early January 2018 and finally 2,800 in late January. Trump’s proposed pro-growth agenda aimed at accelerating economic growth, reducing regulation, increasing spending, slashing taxes, and boosting jobs and corporate profits has led to a steady record market. Additionally, the United States emerged as a healthier economy dodging the financial crisis and the Great Recession, with GDP growth rising to 2.5% in the fourth quarter of 2017 from a contraction of 5.7% seen in March 2009. The unemployment rate has fallen to 4.1% currently from 10% in October 2009. Further, Americans have an optimistic view of the economy with confidence hitting the highest level in more than 17 years. Moreover, a combination of other factors like return to the earnings growth, jump in oil price, and the prospect of higher interest rates added to the strength. While there have been winners in every corner of the space, several ETFs have easily crushed the market by wide margins. Below, we have presented a bunch of top-performing ETFs of the nine-year bull market that will continue to outperform in the coming months given that these have a Zacks ETF Rank #1 (Strong Buy), 2 (Buy) or 3 (Hold). The First Trust Dow Jones Internet Index Fund (NYSEARCA:FDN) targets the Internet corner of the broad technology space with AUM of $7.1 billion and average daily volume of around 457,000 shares. FDN follows the Dow Jones Internet Composite Index and holds 42 stocks in its basket. Expense ratio comes in at 0.54%. The product has a Zacks ETF Rank #2 with a High risk outlook. The First Trust NYSE Arca Biotechnology Index Fund (NYSEARCA:FBT) follows the NYSE Arca Biotechnology Index, which measure the performance of companies in the biotechnology industry that are primarily involved in the use of biological processes to develop products or provide services. FBT holds about 29 securities in its basket and charges 56 bps in annual fees. It has accumulated $1.4 billion in its asset base and trades in a moderate volume of around 60,000 shares a day. FBT has a Zacks ETF Rank #1 with a High risk outlook. The Guggenheim S&P 500 Pure Value ETF (NYSEARCA:RPV) offers exposure to the value corner of the broad market by tracking the S&P 500 Pure Value Index. It holds 114 securities in its basket and charges 35 bps in annual fees. RPV has amassed $898 million in its asset base and trades in a good volume of more than 92,000 shares a day on average. It has a Zacks ETF Rank #2 with a Medium risk outlook. The First Trust NASDAQ-100-Technology Sector Index Fund (NASDAQ:QTEC) offers broad exposure to the technology sector by tracking the NASDAQ-100 Technology Sector Index. It holds 37 stocks in its basket with AUM of $2.5 billion and average daily volume of around 218,000 shares. QTEC charges 60 bps in annual fees and has a Zacks ETF Rank #2 with a High risk outlook. The iShares S&P Technology Semiconductor Index Fund (NASDAQ:SOXX) targets the semiconductor corner of the broad tech space and follows the PHLX SOX Semiconductor Sector Index. It is home to 30 securities and has AUM of $1.6 billion. SOXX charges investors 48 bps in annual fees and trades in a solid average volume of around 587,000 shares a day. It has a Zacks ETF Rank #1 with a High risk outlook. The iShares Dow Jones US Aerospace & Defense ETF (BATS:ITA) offers exposure to 38 U.S. companies that manufacture commercial and military aircraft and other defense equipment. It follows the Dow Jones U.S. Select Aerospace & Defense Index and charges 44 bps in fees per year. ITA has accumulated $5.8 billion in AUM and trades in good volume of around 317,000 shares. It has a Zacks ETF Rank #1 with a Medium risk outlook. The Rydex S&P SmallCap 600 Pure Value ETF (NYSEARCA:RZV) targets the small-cap value segment of the broader U.S. market. It tracks the S&P SmallCap 600 Pure Value Index, holding 163 securities in its basket. The product charges investors 35 bps in annual fees. RZV has amassed $176.3 million in its asset base while trades in a lower volume of about 32,000 shares a day on average. The product has a Zacks ETF Rank #3 with a High risk outlook. The Vanguard Consumer Discretionary ETF (NYSEARCA:VCR) targets the consumer discretionary sector and follows the MSCI U.S. Investable Market Consumer Discretionary 25/50 Index. It holds 372 stocks in its basket with AUM of $2.7 billion. VCR is the low choice in the space, charging just 10 bps in annual fees while volume is moderate at nearly 85,000 shares a day. The product has a Zacks ETF Rank #3 with a Medium risk outlook. The Oppenheimer Financials Sector Revenue ETF (NYSEARCA:RWW) offers investors targeted access to the same stocks as the S&P 500 Financials Index but weighed each security by revenues instead of by market capitalization. It holds 69 stocks in its basket. RWW failed to garner investors’ attention as depicted by its AUM of $59.5 million and average daily volume of 5,000 shares. It has 0.45% in expense ratio and a Zacks ETF Rank #1 with a Medium risk outlook. 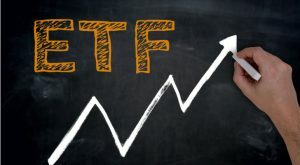 Article printed from InvestorPlace Media, https://investorplace.com/2018/03/9-etf-winners-9-year-bull-run-ggsyn/.